Serious question. Look, we've all known that Judith has been getting more and more ratty as time goes on. Just when we think she can't sink any lower she surprises us again. But this time she's really gone over the edge. I mean really and truly. I've been a bit busy the last few days and have only just got around to checking out the various denier websites. I was surprised to see Judith Curry (archived here) putting up some old, wacky and long bit of idiocy from John Christy. Back in 2011, John was whining to the House Science, Space and Technology Committee, protesting the IPCC, the northern hemisphere temperature reconstructions pre-2001, and all else besides. Earth is as cold as a summit in Central Greenland? At face value John, and therefore Judith, were doing a Denier Don Easterbrook, arguing that the temperature of earth is the same as it is on the top of the summit in Greenland. John was complaining that a paper by Dahl-Jensen et al (1998) wasn't referred to in Section 2.3.2 in Chapter 2 of TAR, Temperature of the Past 1,000 Years. Yes, they are talking about the IPCC WG1 report from 2001, thirteen years ago. Not the current report, not the 2007 report. The third assessment report from 2001. Anyway, John complained that instead of discussing the temperature of Greenland's ice sheets over the past 1,000 years as if it represented global temperatures, the authors decided to discuss the temperatures of the whole world over the past 1000 years as far as it was known at the time (weird, huh?). Turns out that back then (as is still the case to a great extent) there was an emphasis on the northern hemisphere reconstructions because there wasn't a lot of data for the southern hemisphere in 2001. To me Dahl-Jensen et al.’s reconstruction was a more robust estimate of past temperatures than one produced from a certain set of western U.S. tree-ring proxies. But as the process stood, the L.A. was not required to acknowledge my suggestions, and I was not able to convince him otherwise. It is perhaps a failure of mine that I did not press the issue even harder or sought agreement from others who might have been likewise aware of the evidence against the Hockey Stick realization. Note too that there were several paleoclimatologists as lead authors of Chapter 2, so I don't know why John talks about "him" rather than "them". It's a case of the Serengeti Strategy again I guess. The early Holocene was generally warmer than the 20th century but the period of maximum warmth depends on the region considered. It is seen at the beginning of the Holocene (about 11 to 10 ky BP) in most ice cores from high latitude regions e.g., north-west Canada (Ritchie et al., 1989), central Antarctica (Ciais et al., 1992; Masson et al., 2000) and in some tropical ice cores such as Huascaran in Peru (Thompson et al., 1995). It is also seen during the early Holocene in the Guliya ice core in China (Thompson et al., 1998) but not in two other Chinese cores (Dunde, Thompson et al., 1989; and Dasuopu, to be published). North Africa experienced a greatly expanded monsoon in the early and mid-Holocene, starting at 11 ky BP (Petit-Maire and Guo, 1996), and declining thereafter. In New Zealand the warmest conditions occurred between about 10 to 8 ky BP, when there was a more complete forest cover than at any other time. Glacial activity was at a minimal level in the Southern Alps and speleothem analyses indicate temperatures were about 2°C warmer than present (Salinger and McGlone, 1989; Williams et al., 1999). By contrast, central Greenland (Dahl-Jensen et al., 1998), and regions downstream of the Laurentide ice sheet, did not warm up until after 8 ky BP (including Europe: COHMAP Members, 1988; eastern North America: Webb et al., 1993). Nor did John Christy point out that the temperature reconstructions described in Chapter 2 of TAR were based on many more proxies than just tree rings. Nor that there were several reconstructions discussed, not just those of Michael Mann and colleagues. Nor that there were lots of caveats in TAR (as always). Now the fact that John and Judith think that the summit of Greenland on its own is a proxy for global temperatures is wacky enough and way beyond Judith's usual fare. But she not only put forward John's silliness as if it ought to be taken seriously, she threw in snippets of stolen emails as evidence of something or other. I mean we're talking TAR, the third assessment report. Judith is going back thirteen years. Christy’s assessment, when combined with the UEA emails, provides substantial insight into how this hockey stick travesty occurred. John Christy's assessment! Climategate! Sheesh, Judith is scraping the bottom of the barrel isn't she. What will Judith write about next? The fake Oregon Petition? As time went on, nations would tend to nominate only those authors whose climate change opinions were in line with a national political agenda which sought perceived advantages (i.e. political capital, economic gain, etc.) by promoting the notion of catastrophic human-induced climate change. Scientists with well-known alternative views would not be nominated or selected. Indeed, it became more and more difficult for dissention and skepticism to penetrate the process now run by this establishment. As noted in my IAC testimony, I saw a process in which L.A.s were transformed from serving as Brokers of science (and policy-relevant information) to Gatekeepers of a preferred point of view. John Christy is so deluded as to think that politicians throughout the world will gain economically and politically as a result of global warming. Tell that to Kevin Rudd and Julia Gillard! Tell that to Tony Abbott! Tell that to the James Inhofe and the GOP! 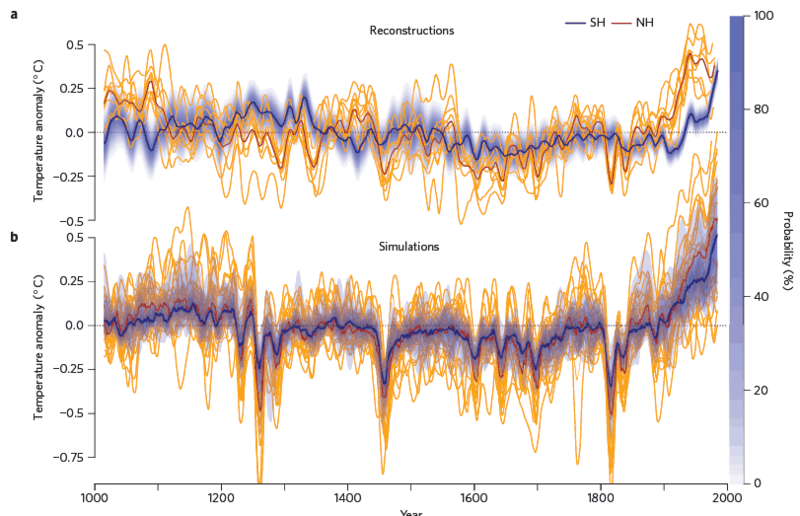 Figure 2 Temperature variability over the past millennium. 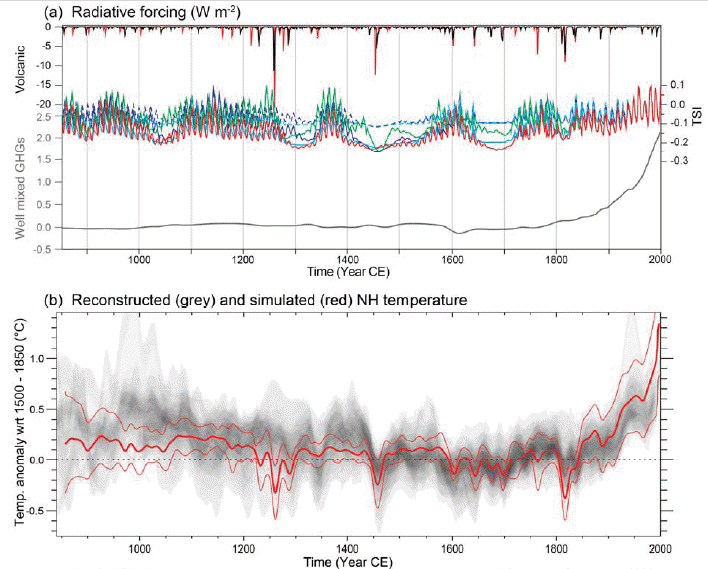 a, 30-year loess filtered ensemble mean temperature reconstruction for the Southern Hemisphere (SH; blue) and Northern Hemisphere (NH; red) relative to the millennium mean for the period 1000–2000. Blue shading based on Southern Hemisphere reconstruction uncertainties (Supplementary Section 2.4). Thin orange lines represent the ensemble means of the nine individual temperature reconstructions making up the Northern Hemisphere dataset5. b, as a but for the 24-member climate model ensemble. Note for consistency with reconstruction data, simulated temperatures are shown as individual simulations for the Northern Hemisphere and a probabilistic range based on ensemble percentiles for the Southern Hemisphere. So she's back to basics - Judith Curry waging a war on the IPCC and Michael Mann. That's bare bones Judith Curry - in a nutshell. Forget science. Forget politics. For Judith, this is personal. It's a question I've pondered myself. It's one thing to be outside the mainstream, but it's another to promote things that are so obviously wrong as to be embarrassing. The only thing I can conclude is wither that Judith's understanding of basic science is so poor that she doesn't realise that what she's promoting is embarrassingly wrong, or, she understands that this is wrong but doesn't care about scientific integrity. Neither is particularly paints her in a particularly complementary light. It's personal with Judith. It shines through and has ever since she first started bagging Michael Mann and the IPCC back on Keith Kloor's blog. I don't know what is behind it but it's not science and it's not politics either. It's definitely personal. It might go back further than that but that's where I first saw it. Yes, there does seem to be a personal element to it. Curry's understanding of science is just fine and I'll wager she feels her integrity is also intact, despite all appearances to the rest of us. Seems to me she's suffered an interior civil war between science and ideology; it looks as though the army of evidence and facts has lost or is at least heavily besieged. We know from research that a person undergoing this process can feel perfectly justified. Stepping back from the immediate annoyance of the situation, Judith Curry is a cautionary lesson for us all. It's a rare (vanishing rare?) person who is not susceptible to this kind of struggle. As it's an enigma that might affect any of us, unraveling the mystery of this kind of swerve would behoove everybody. Closer to the person, it probably sounds horribly condescending but I actually feel kind of sorry for her. It's not a comfortable situation, not at all. I feel the same way. She was a respected publishing climate scientist until a few years ago, and then she sort of went off the deep end trying to support Montford's The Hockey Stick Illusion conspiracy ideation on Real Climate, of all places. Needless to say, if ideology can trump years of training as a scientist, that's not a good portent for the future of humanity. Sou asks "What will Judith write about next? The fake Oregon Petition?" Judith Curry said on June 20th, 2010 in this rotted link: "When skeptical groups come up with lists of 17,000 (or whatever names) of scientists, many with Ph.D.s that do not believe in global warming, I used to feel justified in ignoring this "because they aren't climate scientists," and after all, nearly all (important) climate scientists agree with the consensus. I no longer feel justified in ignoring this, and can recognize my former self-righteous tribalism for what it was." And again on July 13, 2012: "... The NIPCC report Appendix contains a list of over 30,000 scientists that do not support the IPCC consensus. While the NIPCC is nowhere near as well known as the IPCC, much effort has been undertaken by those that support the IPCC consensus to discredit skeptical voices including the NIPCC. Apart from the issue of the relative merits of the IPCC versus the NIPCC reports, the mere existence the NIPCC report and the list of 30,000 scientists disputing the findings of the IPCC raises the issue of whether a scientific consensus on climate change makes sense, given the disagreement, uncertainties and areas of ignorance." OMG - she wasn't just touting the discredited Wegman report she actually touted the Oregon Petition AND the NIPCC nonsense. I stand corrected. She lost her grip on reality and fell over the edge many moons ago. I didn't realise. I remember her being quoted as saying (paraphrasing) that she was motivated by the political opinions of her family and friends in Georgia. I lost the quote, though, so if anyone can find it please reply with a link. I think this explains why she's still department chair, but only because the south is so conservative and the strong correlation between political conservatism and climate contrarianism. What a bunch of Lemmings in this blog! For Judith, this is personal. Which spotlights the mystifying obsession amongst contrarians over the meme that there was an MCA that was global, synchronous and as warm as, or warmer than, the present. Surely that would be good evidence that the climate system is moderately sensitive to radiative perturbation? To be fair, paleoclimate behaviour demonstrates this very clearly, so the evidence that there was no global, synchronous MCA as warm as or warmer than the present is somewhat irrelevant to the consequences of increasing GHG forcing at an exceptionally rapid rate. It's also odd that anyone should point to the early Holocene warmth (most clearly expressed in the NH) without mentioning orbital forcing, which is well understood to be the cause. John Christy's complaint about authour selection is ironic. Exxon-Mobil sent a memo to the Bush Whitehouse in 2001 asking whether Robert Watson could be replaced as IPCC head, and also suggesting that John Christy and Richard Lindzen replace the "Gore / Clinton" scientists in the remainder of the TAR process. Christy and Mann have been involved in the tussle over the Dahl-Jensen et al., 1998 paper, with Christy unable to see the flaws in the Dahl-Jensen paper, and the flaws with using a single proxy. (Yet Christy then complains that Mann's paper relies on a couple of bristlecone proxies, which of course was not the case). Yes the Dahl-Jensen paper was good science, but it alone cannot be used to determine the average temperature of the globe, as it suffered from a high level of regional-scale variability. Mann pointed this out to Christy in this climate gate email. You see, most people think that the climate gate emails showed an abuse of science, but what they in fact show is the complete opposite. But climate gate is ancient history, and since then the science has moved on. There have now been numerous multi-proxy reconstructions, and they all show that the MWP global climate was cooler than the 21st century global climate. The obsession by deniers to try and discredit Mann and the hockey stick is one of extreme futility, and is what I consider a 'tell' that you are dealing with an obsessive ideological driven nutter!! Although DC's piece was the original source, the statistics can be heavy going for a general audience that might not be into time-series. I often point at Nick Stokes' laterEffect of Selection in the Wegman Report, as it may be more accessible to a general audience, since it graphically focuses on the effect of the 100:1 cherry-pick. The other problems *could* have been incompetence, but the 100:1 had to be deliberate falsification | fabrication and Nick does a nice graphical presentation. Let's no forget the t-shirt Curry got as award in Lisbon three years ago (from Tallbloke). Yes, awarded a T-shirt by someone who not only doesn't believe in the greenhouse effect but also thinks there's still an ether. "… Seems to me she's suffered an interior civil war between science and ideology; it looks as though the army of evidence and facts has lost or is at least heavily besieged. We know from research that a person undergoing this process can feel perfectly justified." Judith Curry's cynical game: "CAGW Memeplex"